Bilal, if you’re listening, we need this image on a t-shirt. I know you think my throwback is cute and all. But this B-ollower, as he likes to call his tweeple, is ready for an upgrade just in time for the new album. This has been covered all over the innanets, but judging from some of the comments I’m seeing on my YouTube videos, some of ya’ll are still not woke. Bilal fans and stans, you’ve waited not so patiently for nine years for an official project and the time has finally come. It’s official, Airtight’s Revenge will in fact see the light of day. September 14, it will be in stores and online everywhere for your purchasing pleasure. There were snippets from the entire album posted on the internets a few weeks ago but most outlets have removed them. Completely understandable. Bilal and Plug Research aren’t taking any chances with this one. I don’t think the fans can take another Love for Sale debacle. Since my interests these days are taking me in the direction of the fusion of new media and music promotion, I’m excited at the way he using social media to promote the album and interact with his fan base. He joined Twitter earlier this year and already has 10K followers. I expect that to grow exponentially once the album is released and he reclaims his spot as one of THE best to touch the mike. He actually talks to his fans and doesn’t just use the tool as a one way “buymyshitcometomyshow” broadcast medium. He shows that he actually reads what people are saying to him by retweeting. He crowdsources by asking questions such as what we think about him touring with a particular artist. He shares photo and video from shows. He’s planning tweetups in cities where he is touring. It’s all very authentic. In short, he’s doing it right. Mark your calendars for September 14. DC area tweeps, you’ll be happy to know that an album release show has already been set for September 19th at the Birchmere. Tickets will be on sale via Ticketmaster on July 23rd. It will sell out. Meanwhile, take a listen to this great conversation between Bilal and Gilles Peterson. As Giles plays tracks from the new album, which Bilal says he took the Frank Zappa approach in creating, they talk about the new music; what he’s been up to these past nine years; the lost album; record industry rule 4080; what’s poppin in his iPod; and how DC is the bestest fan base ever. And for goodness sakes, get on Twitter already. 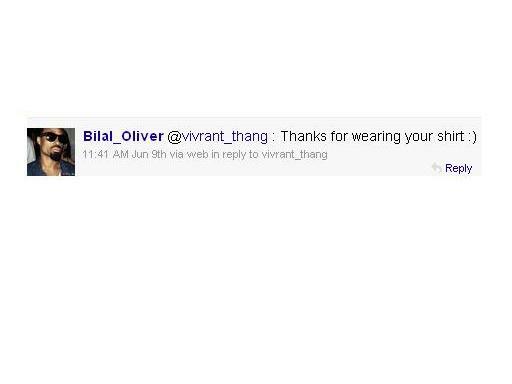 Follow Bilal….and me. For a few seconds after reading this post via email I got super excited. Fantasizing about listening parties I’d have and buying a dozen copies for stocking stuffers for the holidays. Following he online and tour date on the east coast. Then reality set in… I’ve been in this place too many time with Bilal, so I will continue too patiently, Fortunatly for this prophet he has very very few that match his artistry, so we have no other option but to wait. Sebastian, believe me, I completely understand! Your side eye has a right to be in overdrive. However, I truly believe this time that you can go on ahead and plan a listening party or two because we will have albumS to cop on September 14. If you listen to the interview I have linked, industry rule 4080 was in full effect with Love for Sale. I think you’ll hear that this is an entirely new situation he’s in with Plug Research. Thanks for that… Any word on a (legal) release of previously unreleased work, specifically the ‘Love’ album? Yes… I do need to buy CDs, in support of artist I love and a subconscious feeling of ownership. Doubtful. It’s sitting on the record company hard drive and he doesn’t own the Master. Besides, I think he’s past that. He’s now making the music he wants to make on his new label. In the constantly evolving digital music world, it has become clear that artist engagement is key to ensure successful career development and survival for artist, manager and recording labels. If an artist is unwilling to engage with their fans online and via mobile, it is my view that perhaps they should reconsider being an artist as a career path. Great article. In total agreement. I tweeted this out. Thanks for sharing. Speaking of Bilal, Im cracked on on his song “Free.” It’s been on repeat for days. Any chance that he will drop an official (or not so official) version of the remix of “For You” that he did at the show in DC last December? I listened to a show he did in Paris a few weeks back, but he did a completely different mix of it. Still sounded nice, but I’m really partial to that Black Cat show. I’d buy that on a single (do they still make those? ), iTunes, or whatever. It’s doubtful. I think the focus will be on the new music from here on out.